As I'm sure you're all aware of, paints can get really dried out. Who wants to toss a $4 paint out that has a chance at survival? Since this is Internet and I can't see anyone raise their hands, I'm going to assume nobody wants to. 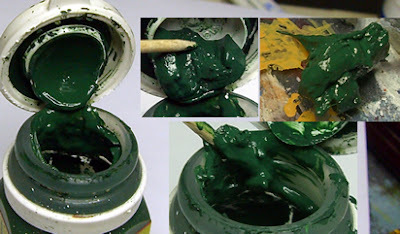 The following are some tips on how to revive paints that have died on you. It won't always work because sometimes, they're just too far gone. Now the paint in the photo to the left is not too bad, but it could do with some cleaning and the following steps still apply to paints dried out even more. The easiest method is just adding two drops of water with an eye dropper, closing up the paint, shaking it, and seeing if it's thin enough. If not, repeat. 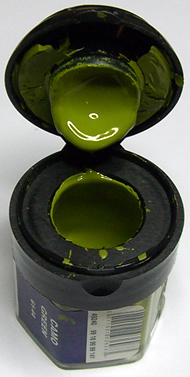 Two drops is a safe number that shouldn't make your paint too runny. Even better, use a professional thinner instead of water. It'll make the paint last longer and preserve its colour. I'll usually use a little matte medium and slo-dri. 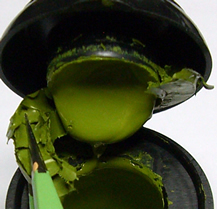 As paint leaks and dries around the rim of the cap of your paint, it slowly thickens until it takes up a large amount of space. When you have a bunch of paint gumming up the cap, the lid won't close properly, causing your paint to dry out quicker. Whenever you notice a build up, it's a good idea to remove the excess paint. Tweezers work well. It takes a while, but paint buildup on the tongue of the inside of your cap will slowly dry out, wasting a lot of paint in one fell swoop. 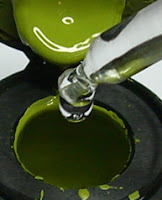 Before it dries completely, use a toothpick to scrape it back into your paint bottle. 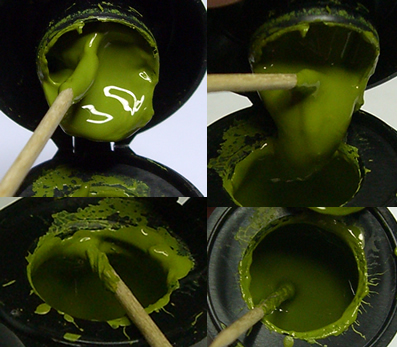 While you're at it, scrape under the inner rim of your bottle, forcing the clinging paint back into the bottom. Once all the clumps are in, stir it back up. You'll probably have to add water since you're dealing with paint that's already in a water deficit. Before signing off, scrape all the excess paint off your toothpick. If you're about to use the colour, you might as well use the toothpick instead of the bottle so that paint doesn't go to waste. If you have problems with thick paint, clumps and such, drop a small ball-bearing or a small screw, nut, bolt, etc in your container. This will help mix your paint when you shake your bottle up. Sometimes, as in the below example, the paint around the bottle has dried out too much to save. You don't want to mix this dry paint back into your bottle. 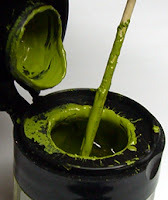 Instead, when you're scraping off the old dried or pasty paint, throw it out, rather than scrape it back into the bottle. Good guide. Another article on things like agitators could be a good followup. Good article. I've used basically the same techniques to save paints that were several years old. @Alex: Thanks. I actually still have 15 year old cylinder Citadel paints that I don't use often, but keep reviving. @Sonsoftaurus: Thanks, and good point - I briefly mentioned it in the article, but I could go into a little more depth later. Great tips that will be well used across the blogosphere! I kinda disagree with all this. Water is more propense to break the body of the paint, ruinning it once and for all. In the other hand, you could use matt medium, it will resurrect you paint too, but much better, safer and will last way more. Seriousy, much better than water, already tried both methods (and others) and IMHO, is the best option. I've heard a few people say this now, and I agree with the theory. However, I've worked with GW brand paints long enough to learn two things - first, that they like to dry out often.. second though, that water works just fine to thin them down, all medium snobbery aside. I use flowaid while painting and now to thin for airbrushes, but I've never had a problem thinning with water.